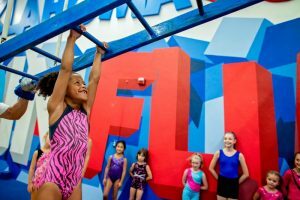 Just like in the evenings, our focus in the Girls Big Gym program is to teach the proper drills and skills for our beginner level gymnasts utilizing the gymnastics equipment and the Ninja Warrior obstacle course. Girls in this class are reaching towards accomplishing specific goals on all events: cartwheels on floor, pullover on bars, straddle jumps on trampoline, etc. This is a high-energy program that places great emphasis on proper form, technique, skill progression and fun. These classes are for girls ages 4 to 6 years old and are offered at 9:30 a.m., 10:30 a.m. and 1 p.m. Girls Big Gym Daytime is not offered during the summer session. This class will re-open in August for the 2019-2020 school year sessions.